As iconic as Chocolate Hills and Yoda-faced tarsiers is Bohol’s calamay – the quintessential pasalubong (souvenir) from the island next to Peanut Kisses (peanut cookies). Calamay is a sticky dessert made of coconut milk, glutinous rice and brown sugar, packaged in coconut shells sealed with red crepe paper. 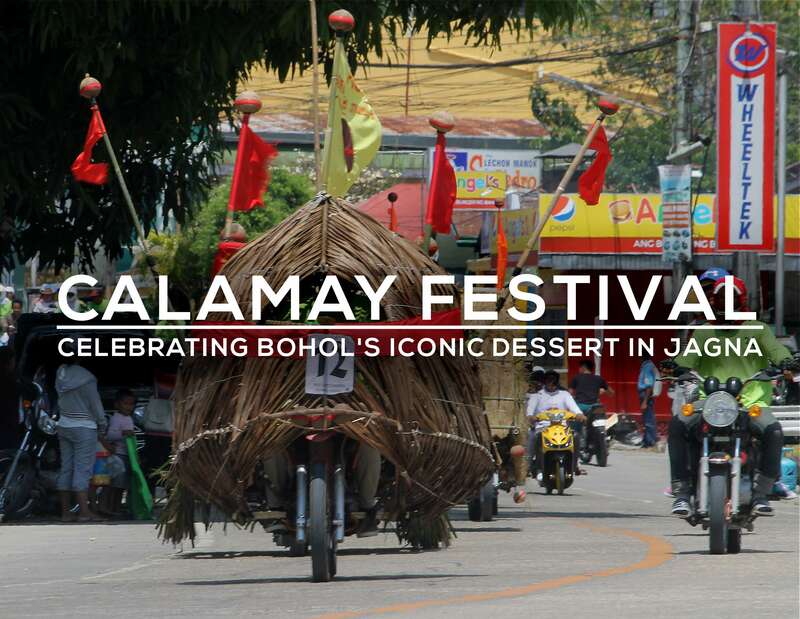 The finest calamay on the island hails from the town of Jagna, along the southern coast, where the dessert originated in the mid-1800s, introduced by parish priest Fr. Mariano Gutierrez. Scooping up the sweet, gooey delicacy into my mouth is one of my fondest memories of visiting the province since I was a child, which explains my excitement when I was invited by provincial tourism to experience a festival created to celebrate the sweet treat! Jagna’s local delicacies are showcased at the town plaza, including the town’s famed calamay! Calamay takes seven hours to cook in a hot kawa or giant wok. In 2015, the town institutionalized the celebration of its 190-year-old calamay-making industry through the annual Calamay Festival held every summer. Last April 27 to 30, I attended the 3rd Calamay Festival through an invitation by Bohol Tourism. The weekend affair kickstarted with a motorcade, which featured motorela (auto-rickshaw) and habal-habal (passenger motorbike) – both important modes of public transportation in town – decked out in real calamay and calamay-inspired decorations. Motorela (auto rickshaw) decorated with calamay during the festival motorcade. A motorela carrying calamay at Jagna. After running down the entire stretch of highway across the municipality, the motorcade ended at the town plaza in front of the church, where a fair has been set up to showcase the products of calamaderos and calamaderas (calamay makers), and other delicacies made in Jagna such as egg cookies, ube polvoron and cheese-flavored taro chips. There were commercially available calamay flavors like the original variety and ube (purple yam), as well as experimental flavors like luy-a (ginger) and tableja (native chocolate). In the middle of the plaza was giant inflatable calamay, which caught the eyes of selfie-loving, snap-happy visitors. Another stall demonstrated how calamay is traditionally cooked in iron kawa (large wok) over fire, a laborious process which takes around seven hours! In the evening, townsfolk and visitors were treated to cultural extravaganza of various Philippine dances performed at the municipal gymnasium by a local high school dance troupe. Jagna is an untapped scuba diving destination known for its deep-sea black corals at Cantagay Fish Sanctuary. Ching’s Calamay is the most popular traditional calamay maker in town. On the second day, we toured the town to see what the municipality has to offer. First, the certified divers in the group –– adventure bloggers Gian and Shiela of Adrenaline Romance, and myself – went scuba diving with Drift Divers Shop of Paseo del Mar Resort – the first and only dive outfit in town. Jagna remains off-the-radar for scuba diving so we had the dive site all to ourselves. We dove at Cantagay Fish Sanctuary, a slope of rubble noteworthy for its patches of endangered black coral at 30 meters. The non-divers in the group joined us for some snorkeling at the topside of the reef. Then we visited a couple of ancestral houses and dropped by two calamay factories to witness how calamay is made the traditional way by hand at Ching’s Calamay, and with the help of automated machine mixers at Jagna Calamay Industry by the Jagna Calamay Makers Cooperative. At Ching’s Calamay, the sticky dessert is cooked the traditional way as it has been for the past 200 years. Workers at Jagna Calamay Industry cut red crepe paper used to seal calamay stored in coconut shells. And, of course, what’s a festival in the Philippines without pageantry? The festival culminated on our second night with Miss Jagna Festival, an annual pageant also held at the municipal gymnasium, where the town’s brightest beauties vied for the title. Reyna Jane Amparado, who trumped other promising candidates with her smart answers during the interview portion of the competition, ultimately was crowned the winner, and will go on to compete for the Miss Bohol title. The Calamay Festival culminated with the crowning of the town’s Miss Jagna Festival. Jagna is an 1-2 hours away from Tagbilaran by van or bus. Take an eastbound vehicle to Ubay or Anda, and alight at the town proper of Jagna. Jagna Rock Resort is a scenic cliffside resort with beautiful sunrises and sunsets over Bohol Sea. During the festival, I was billeted at Jagna Rock Resort (formerly Delilah Rock Resort, Tel. +63 9183154883), a cliffside resort east of the town proper at Barangay Larapan overlooking the Bohol Sea. It’s a good spot for snorkeling and cliff jumping, or to simply watch the sunrise and sunset. Find discounted rates for accommodations in Bohol here!